The key of David will open to the believer the knowledge of the truth of God, which when one receives it is then kept by that wisdom that no one can take away as it is the truth that sets us free and the seal Gods people have in their foreheads (their mind). (Revelation 3:7,8). And to the angel of the church in Philadelphia write; These things saith he that is holy, he that is true, he that hath the key of David, he that openeth, and no man shutteth; and shutteth, and no man openeth; I know thy works: behold, I have set before thee an open door, and no man can shut it: for thou hast a little strength, and hast kept my word, and hast not denied my name. Jesus is an anchor to the soul of all who follow his way of righteousness. He is as a nail in a sure place and since he is the same yesterday, today, and forever we can put our trust in him! (Isaiah 22:21-23). And I will clothe him with thy robe, and strengthen him with thy girdle, and I will commit thy government into his hand: and he shall be a father to the inhabitants of Jerusalem, and to the house of Judah.And the key of the house of David will I lay upon his shoulder; so he shall open, and none shall shut; and he shall shut, and none shall open.And I will fasten him as a nail in a sure place; and he shall be for a glorious throne to his father’s house. We learn later in verse 25 that this sure fastened nail is removed, just as Christ died and rose again and has said come to him all who are heavy laden and he will lighten any burdens which weigh us down. (Isaiah 22:25) In that day, saith the Lord of hosts, shall the nail that is fastened in the sure place be removed, and be cut down, and fall; and the burden that was upon it shall be cut off: for the Lord hath spoken it…..(Matthew 11:27-30). This key of knowledge is greatly important to God and even Jesus was angry with the lawyers who were lightly esteeming the importance of his wisdom that would save many. (Luke 11:52). Woe unto you, lawyers! 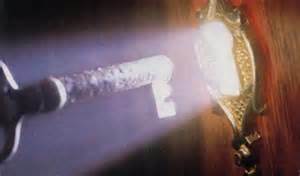 for ye have taken away the key of knowledge: ye entered not in yourselves, and them that were entering in ye hindered.